Texture is this week’s theme for Let’s Be Wild, so let’s take a sunrise walk on the beach and see if we can find any interesting textures! 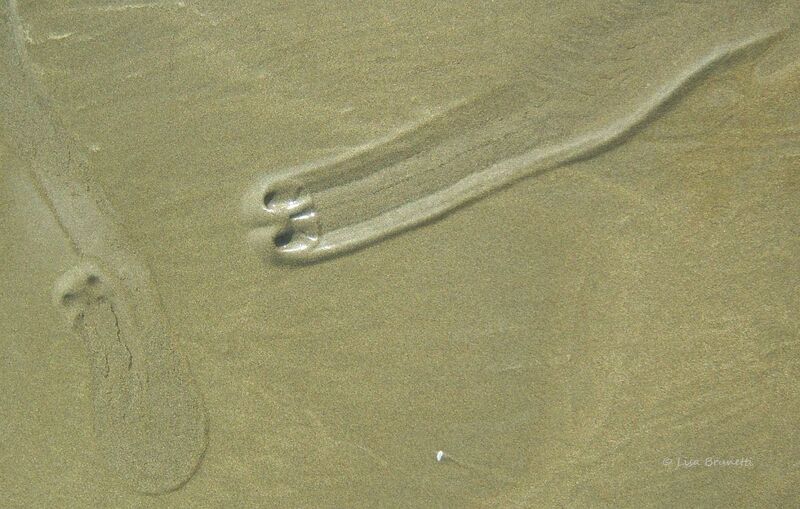 Walking along at low tide, we often see tiny sand dollars patrolling just beneath the surface of the sand. 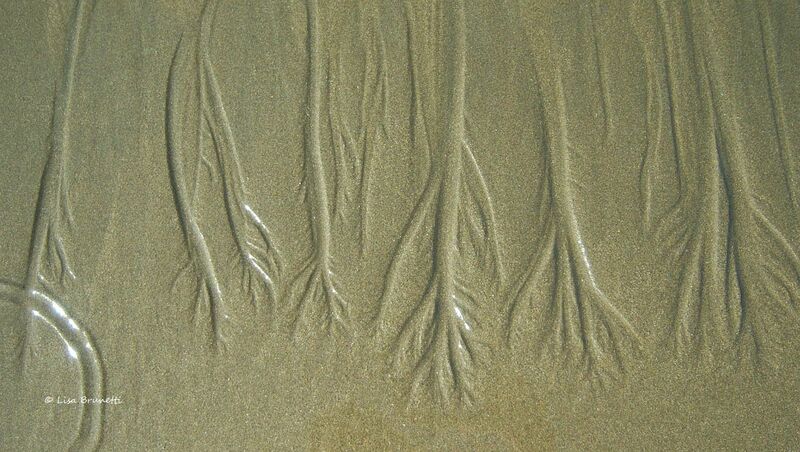 Sometimes the sand patterns make lovely stand-alone artistic images. 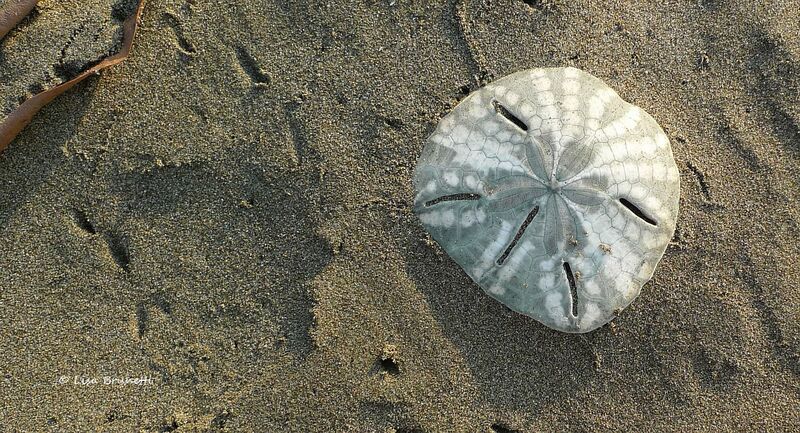 Sand dollars always catch one’s attention. Inspecting one closely, we see lots of texture. We ponder the origin of seed pods. And marvel at the simple beauty of sunlight on a lone almendra leaf. Sometimes we find treasures hiding in those leaves! The hermit crabs will forever catch my attention! They enjoy an early breakfast of tender coconut flesh! There seems to be a new fashion in hermit crab beach attire! This one disrobed before dashing away! At times a rare treat awaits! 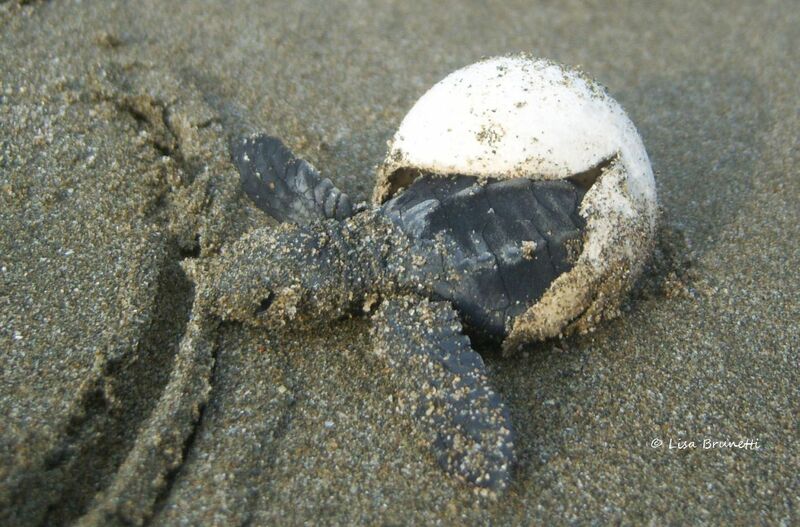 This left-for-dead olive ridley hatchling emerged from its shell! Within a few minutes, it began its journey to the sea! After a full morning, it’s time to head home. Now what did we do with the car keys? Whew! Were we ever lucky! See more images of texture on the Let’s Be Wild site HERE. My entry was entered even later than yours 🙂 But I enjoyed it as well! we would be the two ninas that played too long at recess and realized that everyone else was back in class! yours are all lovely – the first one sort of preps the viewer for the second, which is a knockout winner, and then those amazing colors that tempt the taste buds! it’s great to see so many stunning images of texture! 🙂 Yes we probably would be the last ones running from the playing field when the bell rings and the others are already standing nicely in line! 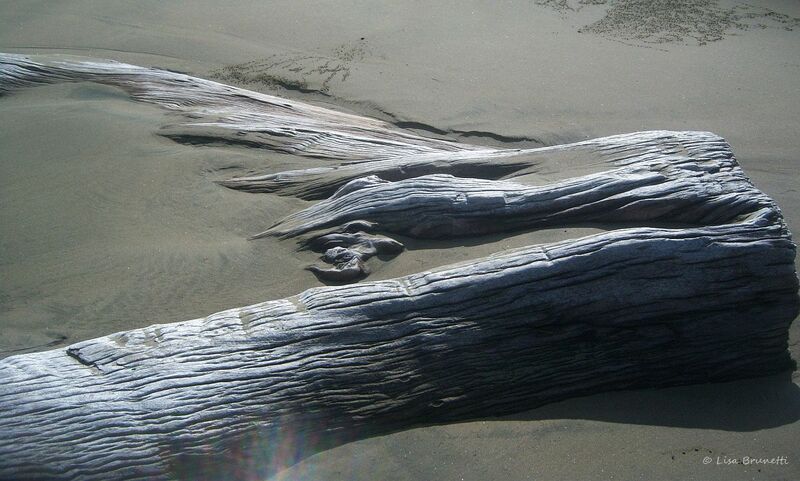 Your sand pattern photos are beautiful! Absolutely brilliant, Lisa! I was on my way to writing a sandy post about the ilhas and as ever got distracted by my Reader. What a great beachcomber you make. That tiny turtle- fantastic! i’m glad you enjoyed the visit, and i totally understand about getting distracted via the reader! yes, that was a great moment when the little turtle came to life before our eyes! I really enjoyed this post, thanks for taking me to the beach early in the morning, letting me look trough your lens. 🙂 I love going to the beach with camera, yuo never know which stories you might find. How nice of you to make time in your schedule to go to the beach with me! I’m glad you enjoyed the outing! love the photos, especially the turtle, so cute ! Great post.. love all the “sea” textures!! Thank you! While scrolling through images, I realized how many I have taken of those small accessories that decorate our planet! You surely have lots of images taken along those clear peaceful streams in your area. Yes, I am very fortunate to have spent my entire life near some body of water; the Mississippi River or smaller lakes and rivers and streams in addition to the Pacific Ocean. After a few weeks in a city, I usually feel quite lost! Delightful (as always). 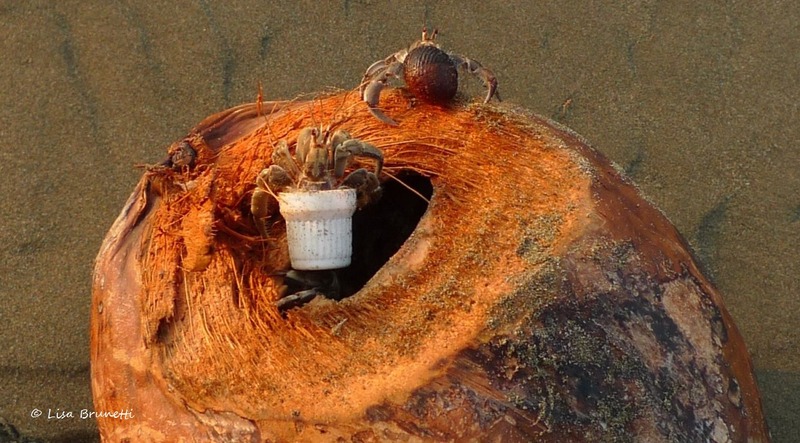 Do you think the hermit crab eats its way into the cocoanut? Fascinating! The locals reap the benefits and convenience of the coconut palms that line that beach. With a few well-aimed strikes of the machete, they open the coconut and drink its mineral-rich water, then toss the coconut to the ground. 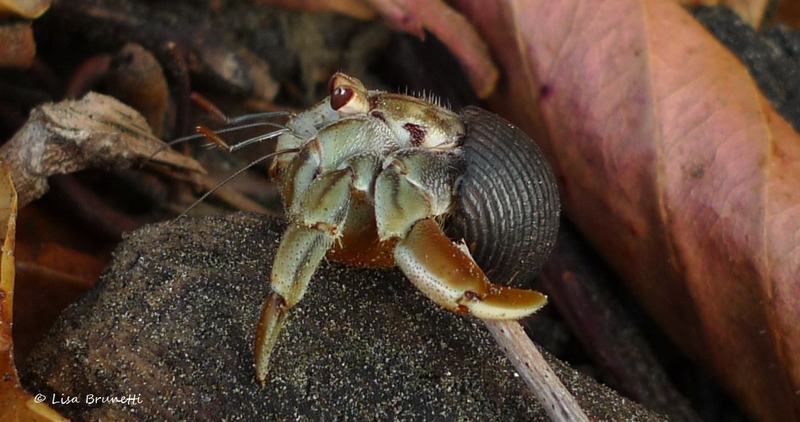 Sometimes the ocean baptizes it then tosses it back on the beach, where the hermit crabs feast on leftovers! 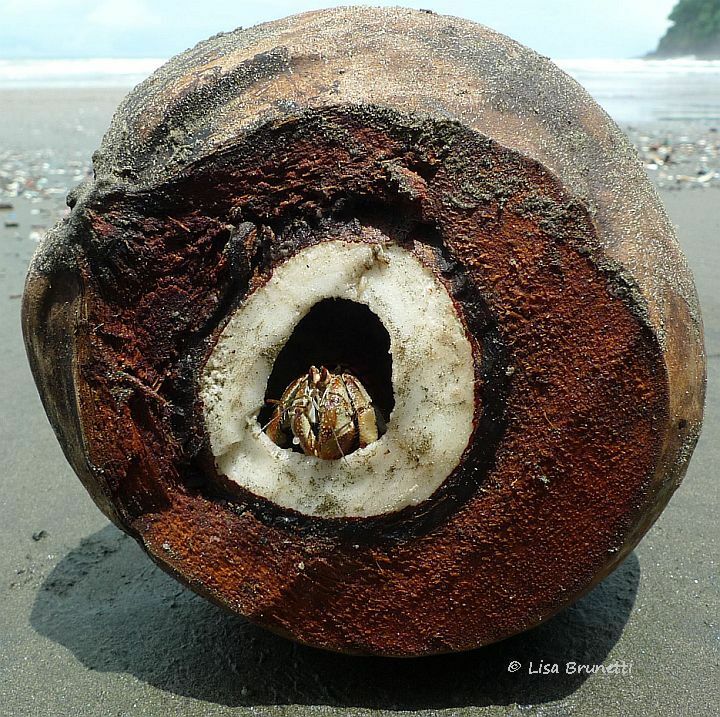 It’s so much fun to pick up a coconut and peer inside! It’s really great when there’s a fiesta going on inside! I knew you would laugh when you saw the keys! Who would have thought that we would be able to relive that moment again through the magic of WordPress?!! Of all of my memories on the beach, my favorite is till that morning when we explored the beach during the lowest tide of the year! Some moments are best shared with friends, and that was certainly one of them, from the beginning of that day until the end! 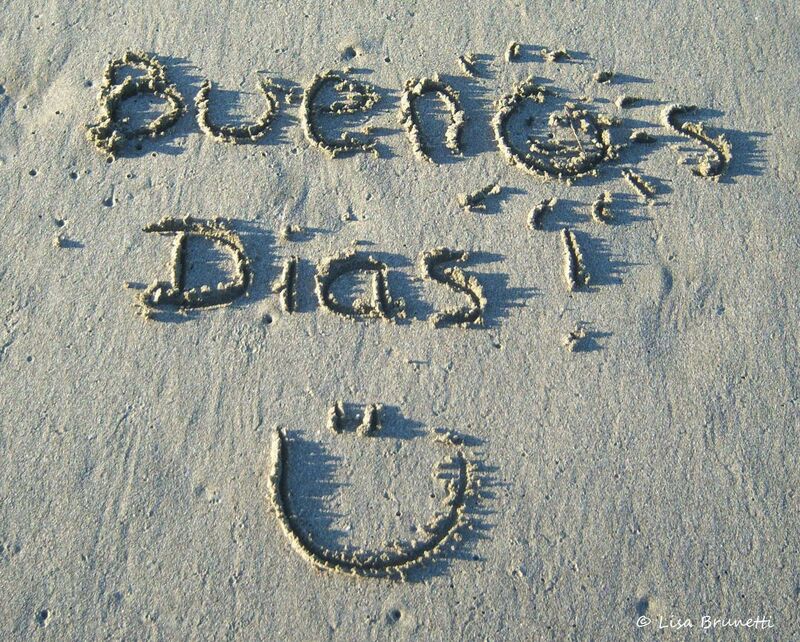 Buenos Dias. Thanks for taking us to the beach this morning. Love the photos Z, and my favorite is the Ridley turtle coming out of the shell. 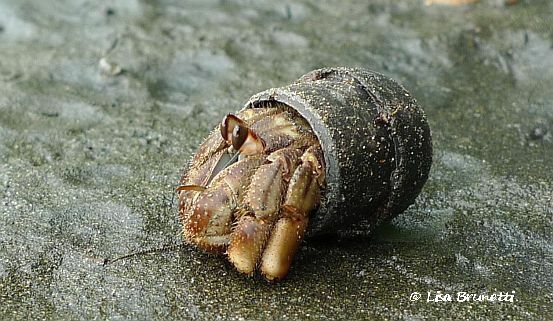 Interesting isn’t it how the hermit crabs use the items around them as “shells.” Looks like they favor the twist tops off of bottles! Nice textures in all these photos! Hugs and have a great day! I almost dropped my camera when i saw that white object emerge from the coconut! it’s great how resourceful the hermits are, yet it also saddens me that our growing litter problem trickles to the beaches. i’m glad you enjoyed the trip to the beach! the video of the high winds was interesting. i’ve not witnessed that kind of weather in a long time! thanks! 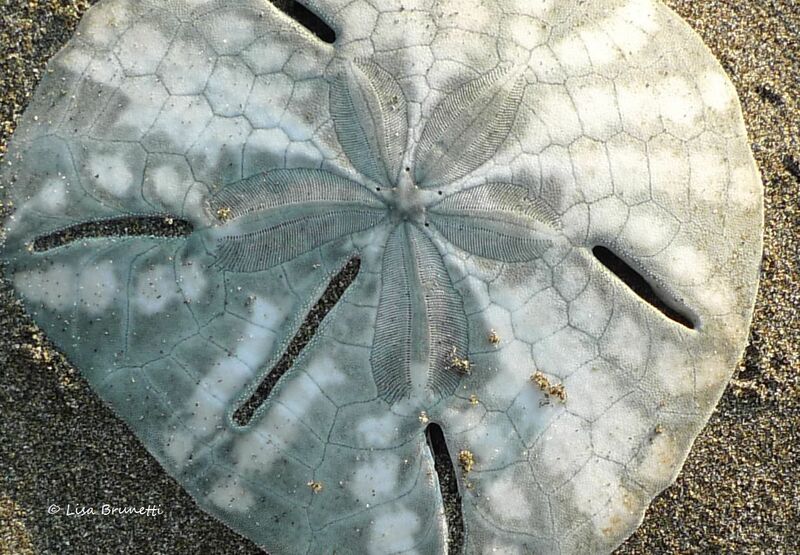 i’ll have to look back and find more images of amazing sand dollars! these were quite small and fragile, though the detail and texture so much more interesting than the older ones. you were kind to take time from your day to walk along the beach with me! oh yes, that’s a great new ditty! sounds like a tgif song to me! thanks, i’m glad you enjoyed the images! I envy your keen observation,Z! 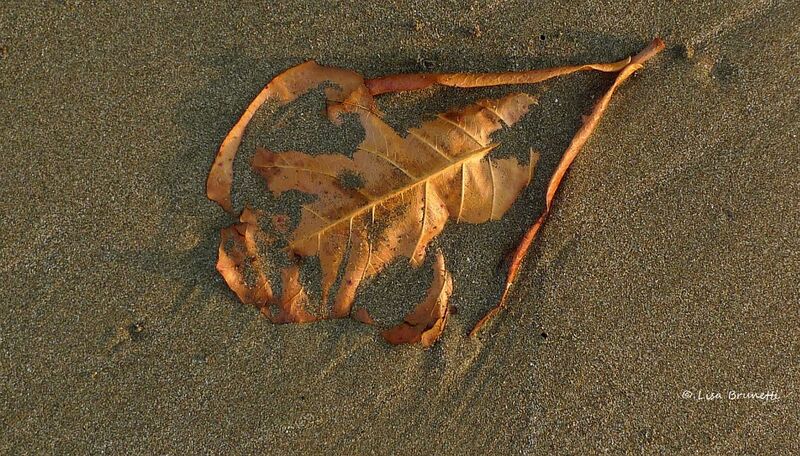 The sand pattern, lone almendra leaf… amazing! Love your texture images, z. The beach is definitely a great place to look, for this challenge. Of course we now are seeing textures everywhere, thanks to that challenge! Love the hermetic crabs! Plus the textures in the sand. gracias! i love hitting that (empty) beach at daylight! 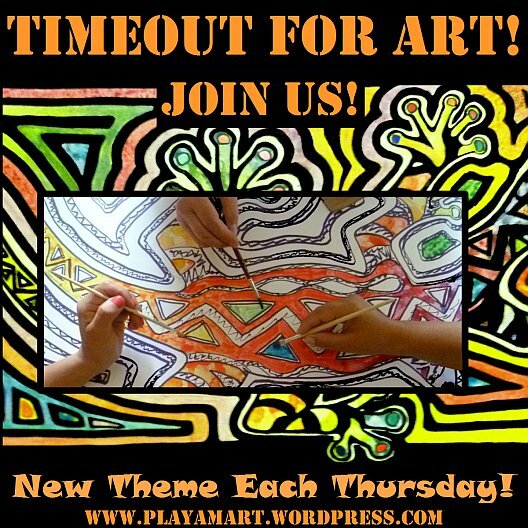 This is a great blog on pics of Texture! Thanks. My sons were amused by the crabs living in ‘plastic’ shells. Do they really live there? He says (to you) : “I love the pictures thank you for showing them to us.” The baby turtles were also a treat. I’m delighted that your sons enjoyed the crabs’ housing options! 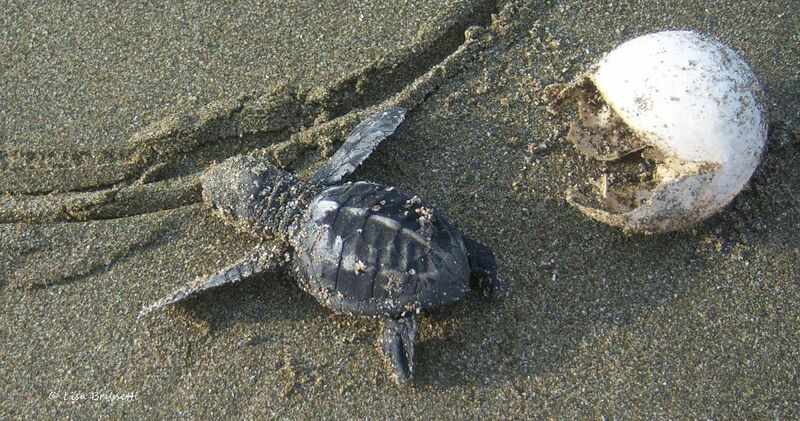 they would surely love seeing those baby turtles scuttling down the beach for their first swim that will last a dozen years before the females return to lay more eggs! Absolutely lovely! Made my day since Winter is pushing Autumn out of it’s way here in this little corner of the world. I am now suddenly feeling warmer and filled with wonderment through your lense. Thanks for sharing! What a kind remark! Thank you! Many people are writing about the cold weather, and I am grateful to live where the temps rarely dip below 65 (F) or go higher than 85! Now you are just bragging! 🙂 But I can never blame someone for being smarter than the rest of us. You share so many posts that show your love for the beach, so i am not surprised that these images gave you comfort! Thanks so much, and it was my pleasure to give you a brief respite from the december weather! Ohh, what a delight, thank you. I remember that fine lines texture on the center star of the sand dollars from my childhood, when we spent spring vacations at a beach in Georgia…the leafy-veiny patterns in the sand – love those…the treasure in the leaf…most people would walk by the leaf on the beach, not inspecting it because it’s not a sea thing, but you chose differently, and that’s to our benefit. And the crabs in their castles – what can I say? Lisa – amazing shots as always. I love the trails the water made in the sand…that’s probably my favorite shot! The turtles are adorable too; we saved 7 of them when a hurricane blew past Florida earlier this year. The storm surge washed almost all the nests out to sea – thousands of nests just gone, but a few eggs that must have been close to hatching floated to the surface on the beach & decided they’d better hatch quickly before they died. The wind was blowing the sand at 50mph though and most of the little turtles didn’t make it more than a foot across the sand before they died from dehydration and exposure. Very sad to find thousands of turtle eggs littering the beach, but maybe a few of the 7 will make it to adulthood. We’re headed to the beach tomorrow. Thanks for the great photos and all the inspiration. Now I’m even more excited. have fun! my friend barb and i went on a wild trip from david to the pacific once uponce a time. we asked the driver to take us to the pacific, and when we arrived, all that was there was a barcelo — no other lodging options! there was one other guest there, and the experience was quite unique! enjoy your time on the coast! You share some of the most amazing photos with us. I didn’t know sand dollars skimmed below the surface like that. they are so hypnotic to watch! 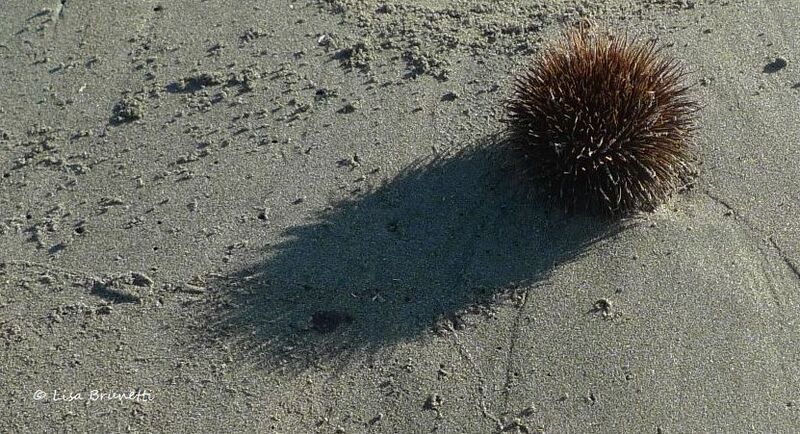 they look like little machines beneath the sand.. sort of like a pacman, nonstop as they cruise in the barely-wet areas for — i have no idea what they eat!